Governor Cuomo has announced he’s visiting Israel this coming weekend, to pursue economic development projects and to bring a “message of solidarity”. 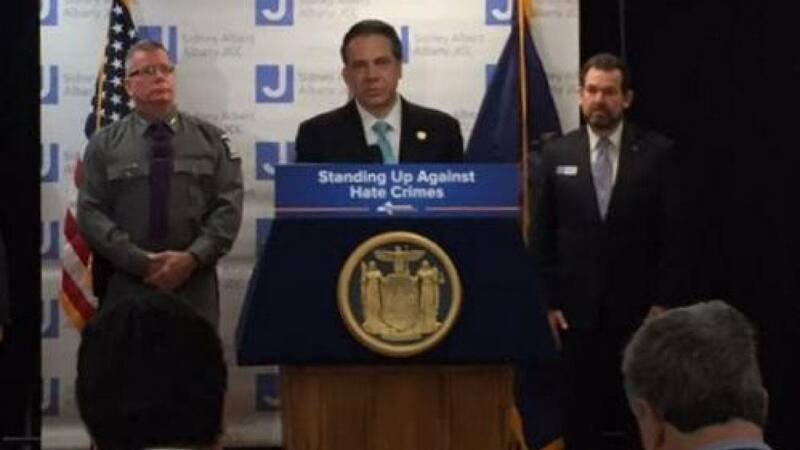 Cuomo also spoke out against recent acts of anti-Semitism at the Jewish Community Center in Albany. Cuomo told a group of Jewish students in Albany to lobby for more funding for private schools that he will be taking a trip to Israel on March 4th to talk about joint technology ventures but he says he’s also going to offer his support as incidents of anti-Semitism are on the rise in the US. “I want to say to the people of Israel and I want to say to the Jewish community, ‘In New York, you are not alone, and every person in the state of New York with any decency and understanding of what it means to be a New Yorker stands with you at this moment, and we speak with one voice condemning this repugnant behavior and we stand arm in arm with the Jewish community through this time of hardship’,” Cuomo told the students. Earlier at the Sidney Albert Jewish Community Center in Albany, Cuomo said the recent bomb threat scares that have led to the evacuation of dozens of JCC’s in New York and around the country are not only “ugly” and “immoral”, but illegal. “We want the perpetrators to know that we are fully committed to doing justice in this case,” Cuomo said. Cuomo repeated that he’s set up a special unit in the state police to investigate the crimes and other hate crimes, and has created a fund for a $5000 reward for information leading to the prosecution of anyone involved in the incidents. $25 million dollars is also in the state budget to beef up security at JCC’s, schools, and other facilities under threat. Meanwhile, US Senator Chuck Schumer is asking the FCC to grant the JCC’s a waiver to trace the anonymous calls placed to the centers, to make it easier to track down the callers.